Due to the recent fire, the kitchen at Hope Haven has been maxed out. Currently, about 150 people are being fed weekly in the shelter kitchen. Although I am no longer with the San Pedro Red Cross, when I was recently asked to do a food drive I could not say no. As many of you know, longtime island Immigrant Gaylynn Kapri recently lost one of her beloved daughters in an unfortunate Colorado Boating accident. She was crushed and asked on facebook to help her heart heal by honoring her daughter and keeping her memory alive by doing something good for someone in need like feeding the hungry. During her too short time on earth, Raegan made many trips to the island and fell in love with Ambergris and it's residents. 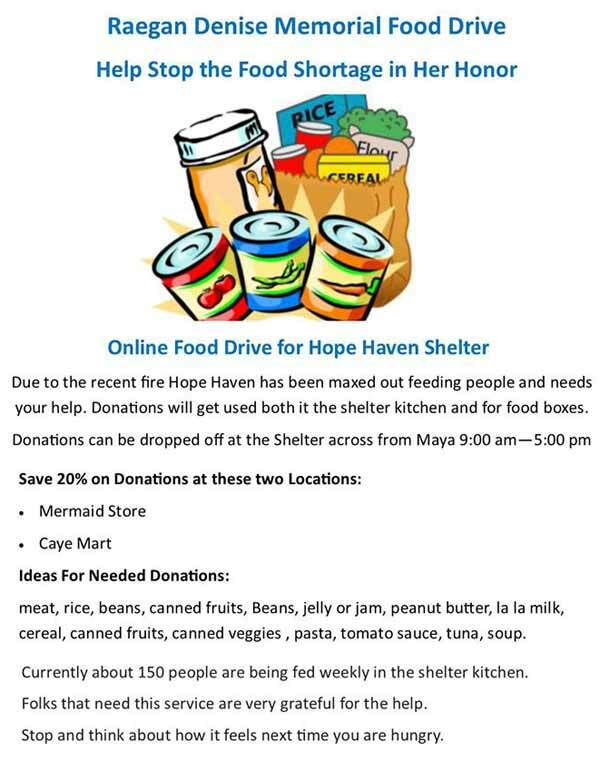 I decided to join the two (with permission from all sides of course) and I give you the Raegan Denise Memorial Online Food Drive for Hope Haven Shelter.